Not so long ago budget crash helmets were cheap, noisy and had few redeeming features. Cut to today and most entry-level lids are a major step-up in quality, offering good protection and comfort for low prices. 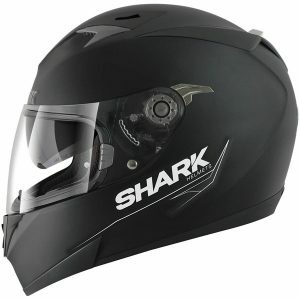 The Shark S900 Dual Special Edition gives a lot of helmet for your money – great protection, comfort and all round visibility. MT Revenge Replica Split is a cracking helmet with a 5 star Sharp rating and the added benefit of increased visibility through its white and red colouring. Secondary considerations may be open, full face or slide-back designs. Colour, insulation, vents, visor options and straps. Dozens of styles and models are available to suit all budgets, with prices ranging from less than 50 pounds to over one thousand. Any helmet sold in the UK has to pass stringent safety tests so we know that they offer at least the minimum safety requirements. But what are these safety tests and how far do they go? The ECE Regulation 22.05 includes a range of tests including hot and cold temperature impact absorption tests, strength and durability tests of retention systems and visor and field of vision tests. For those interested here’s a link to the standards. SHARP is a UK test supplementing the ECE approval requirements by subjecting UK purchased models to more demanding impact testing. The aim of these multiple tests is to measure protection to the brain at varying speeds against flat surfaces and kerbs. 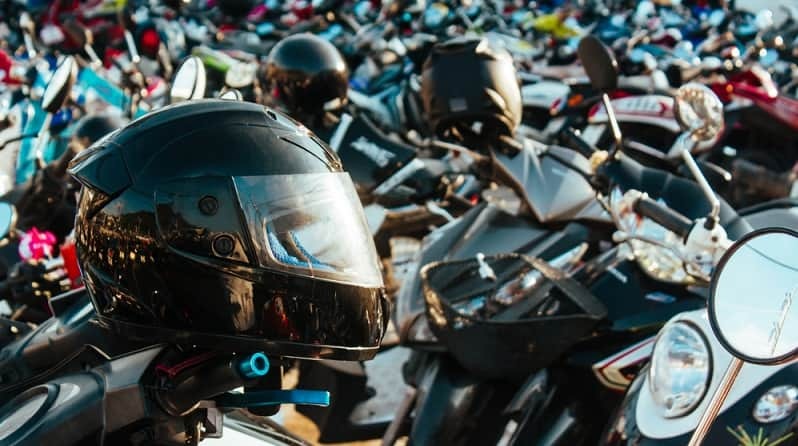 Motorcycle crash helmets come in three main styles although there are up to six variants including half-helmets and off-road designs. 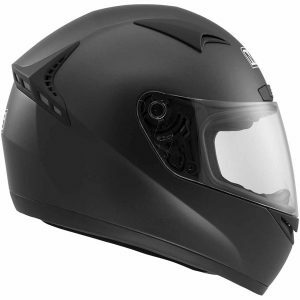 Full-face, flip-ups and open face are the popular models offering varying levels of protection and viewing. Sometimes it’s the visor option that will concern riders most. Consider whether you need a clear or shaded visor. A clear one leaves you the option of just wearing your shades underneath in sunny conditions. Full face helmets usually have a pull-down visor but not always a peak. Manufacturers may offer just one visor option such as a clear one as standard. Others may offer add-on extras including short, half or tinted visors. These come in different styles such as quick-release, micro-metric, double-D style straps. Pick which one you’ll be comfortable with and ensure that you can place and remove your helmet with ease. You don’t want to be caught in the heat or in a stressful situation while having difficulty with your helmet strap. Quick release: Works a little like the operation of a seat belt on a car where a metal end part (usually with a hole in it) goes into a spring-operated catch. The strap length is usually adjusted using metal length adjusters on the strap. Micro-Metric: This buckle system operates by using a toothed tag on the end of a strap which fits into a spring-operated ratchet on the end of the other strap. The principle of this system is similar to that of a reusable cable tie. Double D: This helmet strap system is the oldest, most basic and possibly the safest strapping system for a motorcycle helmet. It works by putting one end of the strap through both of the metal ‘D’ rings on the other strap and then looping the strap back through the first metal ‘D’ to secure it. This video shows how to fix a Double D properly. Not all chin straps can be operated with gloves. This isn’t a major disadvantage if you follow a set sequence prior to your ride i.e. helmet-straps-gloves and go. The same logic goes for taking the helmet off. Channels and ducts helps cool your head in the heat by guiding and circulating air around your helmet while on the move. They also keep it fresh and fog-free so check the types used on any models that take your fancy. The inside lining is important because it affects how comfortably the helmet will sit on your head. The level of insulation also affects the noise levels and with budget helmets it might be more excessive than higher qualities ones. Also, is the lining removable and washable? A headscarf or bandana helps avoid direct contact between the lining and your hair but after time the inside of a helmet may become stale and sweaty. Consider too whether the interior will easily facilitate small speakers. Rider communication systems such as Bluetooth mobile phone devices may require these. Colour is a personal choice but think about how well you can be seen and the safety advantages that a white helmet may offer over darker models. Being the highest point of a motorcyclist a helmet is the most noticeable item from distance. If your motorcycling attire is predominantly dark then consider the benefits of a white or fluorescent model of crash helmet. If a black helmet is your preference think about adding bright or reflective stickers that also stand out from a distance. When looking at any model of crash helmet online you’ll often find a ‘Variants’ section on the product page. Look here to see if the same or similar model is available in different colours or designs. As well as protecting your head what about protecting your helmet? Knocks and scratches can be prevented with a good helmet bag or case. Check if yours comes with these and if not it’s well worth considering buying them as extras. Let’s have a look at our top five models. The shell of the 1.5kg Shark S900 Dual Special Edition model is made from injected thermoplastic resin. With extra protection in mind the design includes a multi-element internal shock-absorber with differentiated density. Inside is a fully removable and washable liner in microfiber fabric. The visor options include as standard an anti-scratch 2.2 mm total vision anti-fog visor and an internal anti-scratch UV protected sun visor. 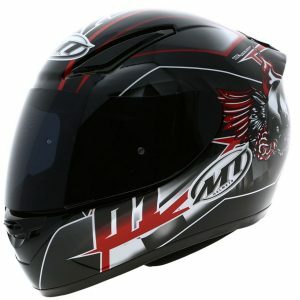 The chin strap is a Microlock quick-release design and the helmet’s stylish external finish is an anti-UV lacquer coating. The MT Revenge Replica Split is both sporty and aerodynamic. The helmet has a removable and washable interior and optimum visor closing. Riders who prefer dark helmets will have the visibility benefit that the additional white and red design offers. The Revenge Replica Split has the appearance of a high quality helmet but costs a fraction of the price. The MT Thunder Solid is a sleek and aerodynamic looking helmet with semi-removable interiors and a micro metric retention system. It has an all-weather design suitable for almost any journey whether commuting or long distance riding. Available in 2 shell sizes this helmet will comfortably fit most head shapes. 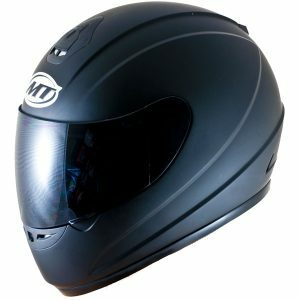 The MDS M13 helmet has a removable and washable interior pad with dry comfort and hygienic treatment. It also has front air intake with rear extractors. A quick release system allows easy visor replacement without the need of special tools. It has a Micro-metric adjustment retention system for quick and easy fastening and removal. None! Good value for money. 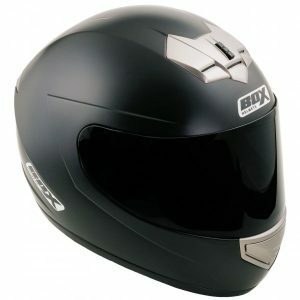 The Box Bx-1 is a full face helmet at an affordable price. Comfortable with good ventilation the helmet holds its own with more expensive models. It is also relatively less noisy than other budget helmets. The wide visor gives it an excellent field of view. The Dexter Prime helmet is a polycarbonate full face helmet and has been designed with affordability in mind. This helmet features an aerodynamic rear spoiler for stability at speed and a removable Dexter Tech interior and cheek pads that are washable. These provide excellent cushioning and insulation for a more comfortable ride. There is a choice of extra visors but each can be removed quickly without tools. Optimal ventilation is located at the front and rear sections. A micro-metric ratchet chin strap provides a good retention system. 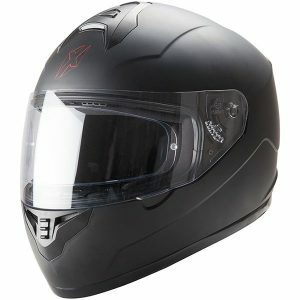 Whether you find your budget helmet in a store or order online be honest when trying it on. A wrong size or awkward fit will become noticeable after several minutes on the road and cause discomfort and distraction. Lightweight helmets might make for an easier ride but offer less protection than heavier more robust models. Your neck muscles will adjust to a heavier helmet in time but avoid anything excessive. In the future you may wish to treat yourself to a more expensive model, but a good quality budget helmet will get you started and even if you upgrade it can still be used for pillions or as a spare.